COLLECT OR STEAL. FAST PACED AND ADDICTIVE STRATEGY CARD GAME. Requires an Internet connection and iPhone 5S, iPod touch 5th Generation, iPad 2 or newer. An epic adventure where fantasy and science collide awaits in this modern card battler from Stoker Games. Players are pitted against each other in a high risk card game where the winner can take the loser’s card gaining them valuable resources with every victory. Conversely, the loser is substantially weakened in the process making their next move in the game critical to surviving and thriving as more turns pass. Quicker duels, card stealing victories and competitive social play gives you a speedier yet equally satisfying collectible card game experience built from the ground up for mobile. 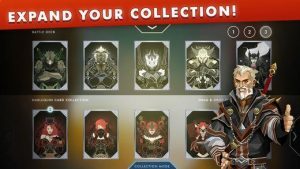 BUILD YOUR DECK – Collect hundreds of beautifully designed cards. Build a collection of uniquely designed cards by conquering your opponents and taking theirs. BATTLE – Put your skills to test and compete in high risk ranked matches. A single game can be played with many rules, changing the nature of every game. CRAFT – Use unwanted and duplicate cards to your advantage by crafting them into more powerful ones. © 2017 Stoker Games Limited. All rights reserved. Eminence and Eminence: Xander’s Tales are trademarks or registered trademarks of Stoker Games Limited, in the U.K., and/or other countries. The ONLY downside is that every 4 or 5 wines (when I reach a new tier) the game crashes. Which stinks because in this game if you win you get to steal a card from the opponent. I’ve missed out on several cards due to these crashes. The game is quick and had loads of room for strategy. Love the artwork.